13 customers were able to try this promotional product before it sold out at 3:22 PM on January 7. The regular, guaranteed lowest price on 100 of these folders would be $309 with set-up, SAVE over $100! Lead your next presentation with confidence and your custom folder! Be organized and prepared with your custom presentation folder the next time that you speak before a group. 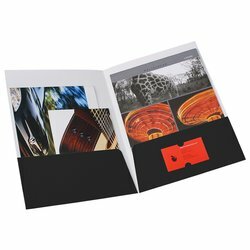 These crisp, solid color folders feature white interiors, flush-cut sides and two 4" high glued pockets. A universal business card slot is provided in the center of the right pocket. Ideal for business meetings, networking events, colleges and school or job fairs. Made of durable 12pt medium gloss paper stock and available in a variety of colors. Your price includes a one color foil imprint on the front center of the folder.